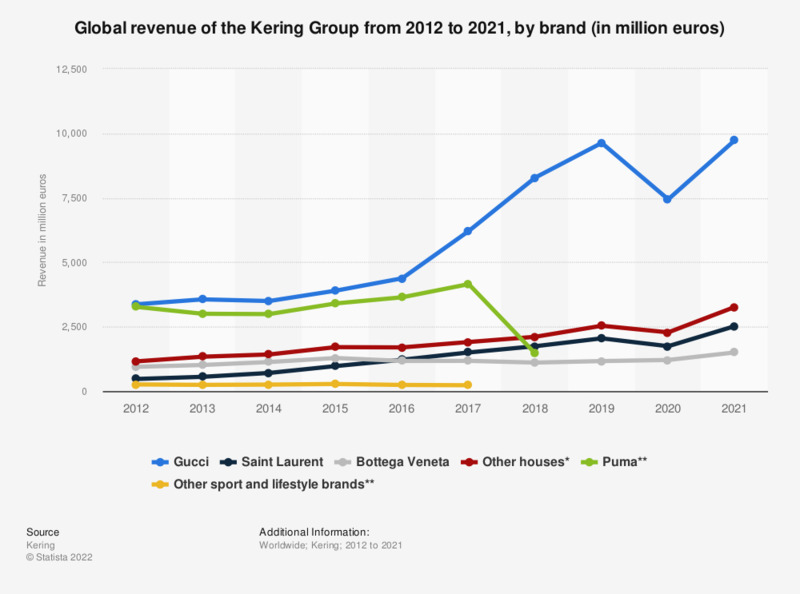 This statistic depicts the global revenue of the Kering Group from 2012 to 2018, by brand. In 2018, Kering's Gucci brand generated a global revenue of about 8.3 billion euros. * Other luxury brands include: Alexander McQueen, Balenciaga, Boucheron, Brioni, Girard-Perregaux and JeanRichard, Ulysse Nardin, Qeelin, Pomellato and Dodo. Discontinued operations as of 2018 are PUMA, Stella McCartney, Volcom and Christopher Kane. No information for other sport and lifestyle brands for 2018. Everything On "The Kering Group" in One Document: Edited and Divided into Handy Chapters. Including Detailed References. Statistics on "The Kering Group"
How much are you going to spend on designer sunglasses in 2019? How much are you going to spend on high fashion clothing and accessories in 2019? How much are you going to spend on precious jewelry and watches in 2019?